It’s often considered a Catholic prayer (capital c) because Catholics are known to memorize certain prayers and trot them out when the occasion calls for them. More about that in a minute. If you’ve ever attended a “mixed marriage” between a Catholic and a Protestant you’ve surely noticed that the bride’s family and friends are on one side and the groom’s are on the other. Of course, if you ever find yourself in such a predicament the first thing to remember is NEVER MAKE EYE CONTACT with anyone on the other side. But soon you may notice that we’re not all that different. In fact, at some point in the proceedings both sides will begin saying, “Our Father who art in heaven.” Wow! We say that prayer too. But, that’s not what’s important. What is important is that all Christians pray the same essential prayer, as Jesus taught us. The Holy Father says the Lord’s Prayer. Kings and presidents say the Lord’s Prayer. Ordinary people say the Lord’s Prayer. And even down-and-out drunks hold hands and recite it at the end of every Alcoholics Annonymous meeting. It is indeed universal. Now, about those memorized prayers, like the Lord’s Prayer, the Hail Mary, the meal prayer, the bedtime prayer and others. Catholics are often criticized for our dependence on these “canned” prayers. Now, there’s not a thing wrong with good extemporaneous prayer. I know people who can make a meal prayer last fifteen minutes. But Jesus just told us not to babble. God knows what we want. “Bless us O Lord and these gifts which we are about to receive from thy bounty, through Christ our Lord” pretty much covers it. Here’s the thing. We begin to memorize all these prayers as small children (at least those of you who are cradle Catholics). They become part of us. They’re so ingrained in our subconscious that we’re praying them even when we’re not aware of it. We become the prayer. When I was in hospital ministry, it wasn’t unusual to have a Catholic patient, near death, maybe even comatose who would move his or her lips when I prayed the Our Father. Sometimes they would even try to make the sign of the cross. Their parents had no idea when they taught them those prayers eighty years ago that those prayers would carry them into the next life. This is pretty strong stuff. So never be embarrassed by all those prayers you learned as a child. Someday they will come in handy. Today’s Gospel reading may well be one of the most significant passages in all of Scripture. Jesus tells His disciples how to pray. who think that they will be heard because of their many words. Do not be like them. Then He teaches them the Lord’s Prayer. When you talk to God, don’t babble. Too often we treat God like Santa Claus. Give me this! Give me that! Give me patience, Lord! DO IT NOW! The Lord’s Prayer can be dangerous in that we ask Him to forgive us our trespasses as we forgive those who trespass against us, but Jesus tells the Disciples this. If you’re not ready to forgive then maybe you shouldn’t ask God to treat you the same way. I’m just sayin……. Lord, grant me the serenity to accept the things I cannot change, the courage to change the things I can, and the wisdom to know the difference. We’re all familiar with this prayer. It’s usually associated with Alcoholics Anonymous and other twelve step groups. It’s known as “the serenity prayer.” But notice that when we say this prayer we’re asking for three things: serenity, courage, and wisdom. It could be just as well be called “the courage prayer” or “the wisdom prayer”. But we call it “the serenity prayer” because that’s what we’re all seeking. Sure, it’s great to be brave and wise, but isn’t serenity what we’re all really seeking? And to be serene, we also need courage and wisdom. Serenity isn’t easily achieved. Again, we’re asking for peace and to be free from all distress; in other words, serenity. We live in a stressful world. We can never be free from all things stressful. But, with God’s help, we can learn to handle stress and to create our own brand of peace in our lives. With can’t control what happens around us, but with God’s help, we can choose to be at peace. The Serenity Prayer isn’t just for alcoholics, or addicts, or any other particular group. It’s something we should all include in our daily prayer lives. When we’re faced with stressful situations, why not take a few seconds to repeat this awesome prayer silently, or even out loud when the situation warrants it. Lord, grant me the serenity to accept the things I cannot change, the courage to change the things I can, and the wisdom to know the difference. Amen! Cyprian lived in the 3rd century, so his words are nothing new. But how many of us pray the “Our Father” in this spirit of community? We often hear people, especially young people, who say “I don’t need to go to mass. I can pray on my own.” But that’s not what Jesus taught us. He said, “Pray like this: Our Father who art in heaven.” The idea that God lives in heaven was nothing new. But calling Him Our Father was. While many of us include this prayer as part of our daily devotion, it’s important to keep in mind that it’s a communal prayer. Even when we pray it in solitude, we’re calling on God in behalf of all people. If there’s one thing we Catholics are good at, it’s praying the “Lord’s Pray”, or the “Our Father”. Of course, we’re not the only ones who use this prayer. Our protestant brothers and sisters pray it too, but not as often as we do. We pray the prayer at every mass. We pray it at morning and evening prayer. We pray it fourteen times when we do the Stations of the Cross and we pray it six times when we say a decade of the Rosary. We take it for granted today that God is our Father. We’ve been taught to think of Him that way since we were little children. 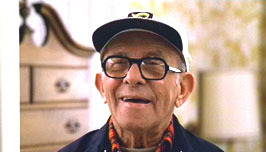 I think most of us picture Him as a kindly father-figure, kind of like George Burns in the movie Oh,God. That was NOT the image of God for the Old Testament Jews. You didn’t call God your father any more than they’d call Julius Caesar “Julie.” It just wasn’t done. Sometimes, to appreciate the scriptures we have to step back and think about what was going on in the world 2,000 years ago. From the vantage point of a first-century Jew, things looked a lot different than they do today. But, even through today’s eyes, it’s pretty awesome that we can speak to the all-powerful Creator of the Universal, in such a familiar way. Even more awesome is that we know He listens to us. For example, when one prays: “Be Thou glorified among all nations as Thou art glorified among us,” and “Let Thy prophets be found faithful,” what else does he ask than, “Hallowed be Thy name “? When one says: “Turn us again, O Lord God of hosts, cause Thy face to shine, and we shall be saved,” what else is he saying than, “Let Thy kingdom come “? When one says: “Order my steps in Thy word, and let not any iniquity have dominion over me,” what else is he saying than, “Thy will be done on earth as it is in heaven “? When one says: “Give me ne, neither poverty nor riches,” what else is this than, Give us this day our daily bread “? When one says: “Lord, remember David, and all his compassion,” or, “O Lord, if I have done this, if there be iniquity in my hands, if I have rewarded evil to them that did evil to me,” what else is this than, “Forgive us our debts as we forgive our debtors “? When one says: “Take away from me the lusts of the appetite, and let not sensual desire take hold on me,” what else is this than, “Lead us not into temptation”? When one says: “Deliver me from mine enemies, O my God; defend me from them that rise up against me,” what else is this than, “Deliver us from evil “? And if you go over all the words of holy prayers, you will, I believe, find nothing which cannot be comprised and summed up in the petitions of the Lord’s Prayer. Wherefore, in praying, we are free to use different words to any extent, but we must ask the same things; in this we have no choice. “Jesus was praying at a certain place, and when He had finished, one of His disciples said to Him, “Lord, teach us to pray as John taught his disciples” His response is what we call today “The Lord’s Prayer” or the “Our Father”. We learn the prayer as kids and we keep it with us for life. Many of our protestant brothers and sisters pray the Lord’s prayer, but we, as Catholics, pray it almost constantly. It’s part of our daily prayers, it’s part of every mass, and many of us pray it privately, sometimes many times per day. It’s a part of our “Catholic DNA”. I’ve visited Catholics at the hospital who are nearly comatose. They may or may not be near death, but they can barely communicate. But when I pray the Our Father, their lips will move along with the prayer. Sometimes they’ll even try to make the sign of the cross. But, have you ever thought about what you’re praying; what the words really mean? In some ways, the prayer was revolutionary for Jesus’ time. The Jews were known for their lengthy, elaborate prayers. They would gather at the synagogue and make a big production of their prayers. Of course, we do that sometimes too, but nothing like the Jews in Jesus’ day were used to. This simple prayer was something new and different. The second thing that was radical about this prayer was the fact that Jesus taught us to call God “Our Father.” The God of the Old Testament was a pretty scary guy. This was the God who destroyed the earth with water in the great flood. He was known to destroy a city if things got too far out of hand. Remember Sodom and Gomorrah? He parted the Red Sea to allow the Jews to pass through then let the waters return, killing Pharoah’s army. The Jews had such a fear of God that, even today they’re afraid to speak His name. But here’s Jesus telling us it’s OK to call Him “Father”. In fact, the word he used was “Abba” which is translated more like “daddy”. A Jewish child might call his biological father “Abba”. It was a very radical idea. So we call on our Abba, our heavenly Father, and the first thing we do is offer Him praise. “Hallowed be thy name”. The word “hallowed” means “holy”, consecrated”, “sacred”, “revered”. Again, for a people who have been afraid to even speak God’s name, now we’re praising His name. Like any child about to ask a parent for something, it never hurts to put them in a good mood by saying something nice. “Thy kingdom come.” We know that God’s kingdom is coming, we just don’t know when. We’re not telling God anything He doesn’t know, but it doesn’t hurt to remind ourselves. “Thy will be done on earth as it is in heaven.” This seems kind of unnecessary. Of course God’s will is done on earth as it is in heaven. We’re not asking for God’s will to be done. We’re reminding ourselves that it is. It always is. When we say “Thy will be done”, we’re acknowledging that we know it and we accept it. “Give us this day our daily bread.” This is the only material thing that’s included in the prayer, but why bread? Why not “give us this day our daily cake”? Well, we know that bread is the basic staple of life. It represents nourishment and it represents the earth. It’s the thing that Jesus chose to turn into His own body inthe Eucharistic sacrifice. Without bread and other natural things that grow from the earth, there would be no physical life. Without the transubstantiated bread of the Eucharist there would be no spiritual life. When we pray for our daily bread we’re not asking that manna drop down from heaven like it did for the Israelites in the desert. We’re asking for the necessities of life; the things we need, not the things we want. Notice, too, that He tells us a story about a man who came to his neighbor’s house in the middle of the night. What did he ask for? Bread. You might think that we’re not just praying for our own needs. Maybe Jesus is telling us that “our daily bread” includes enough to share with our neighbor. Maybe by sharing our bread with someone else, or by dropping off a yellow bag each month for Feed My People, we’re helping God answer someone else’s prayer. Receiving the Lord’s body in the Eucharist every day isn’t a bad idea either. Jesus tells us: “For everyone who asks, receives; and the one who seeks, finds; and to the one who knocks, the door will be opened.” How could He say that when we’ve all prayed for things and not gotten them. What’s up with that? Here’s an example. Someone who’s lost his job might pray to win the lottery. That’s what he wants. An awful lot of lottery winners end up right back where they started in just a few years, blowing their winnings. What our man needs is another job. Most of you probably know Garth Brooks’ song “Some of God’s Greatest Gifts are Unanswered Prayers.” He had prayed that he would marry his high school sweetheart. He didn’t. He married someone else. Years later, he runs into his old flame and discovers that the woman he did marry was a much better match. Who can’t relate to that? Remember, He gives us what we need, not necessarily what we want. If you knock and the door doesn’t open, you might just be knocking on the wrong door. Now comes the tricky part. This might fall under the heading “be careful what you pray for. “Forgive us our trespasses as we forgive those who trespass against us.” That’s how we pray it, but maybe the actual words of the Gospel make more sense: “Forgive us our sins for we ourselves forgive everyone in debt to us.” I don’t know about you, but this one scares me to death. Forgive me because I forgive everyone else? I hope that God is more merciful than I am. In my human weakness I sometimes hold a grudge. Even though we humans may not be as merciful as God, or at least I hope that’s the case, forgiveness is definitely good for the soul. Let me tell you a story about myself. My father ran away from home when I was fourteen. One day he just left and never came back. As kids do, I took it very personally. I hated my dad for a long, long time. One day, after my mom had passed away, I found a letter that my dad had written her either when they were first married, or maybe before. It showed my father to be much more of a caring, loving individual than I ever thought he was. Maybe he wasn’t such a bad guy after all. Every story does have two sides. I decided to give him the benefit of the doubt and forgave him. He was already dead by then so I couldn’t tell him how I felt, but by letting go of all that anger and resentment my whole life changed. After years of carrying around all that emotional baggage, I felt like a great weight had been lifted off my shoulders. My forgiveness may not have done anything for my father, but it definitely helped me. By asking God to forgive us as we forgive others, we’re putting the burden on ourselves to free ourselves from the weight of being judge and jury of the rest of the human race. God has a Son and He already has that job. He doesn’t need my help. “Lead us not into temptation.” Or, “do not subject us to the final test.” This is another tricky one. God doesn’t lead us into temptation. That’s the devil working with our sinful nature. On the other hand, He could if He wanted to. Remember “thy will be done”? So what are we asking here? “Lead us not into temptation” could also read “Lead us away from temptation.” We’re more than capable of leading ourselves into all the temptation we could ever stand. But if God leads us in other directions, away from temptation, then we should be alright. “But deliver us from evil.” This completes the thought. “Lord, I know there’s evil out there. Please deliver me from it, just like you delivered the Hebrews from the Egyptian army. There are some scholars who think that Jesus was just giving us a template, a format for prayer that we could adjust to fit our own situation. But, I can’t think of anything I could change that would make this prayer any more perfect than it already is. We acknowledge God as our heavenly Father. We give Him praise. We recognize that His will will always be done. We ask Him to give us what we need, not what we want because they’re often two different things. We ask Him for mercy. Not just that He be merciful to us, but that He give us the grace to be merciful to others. Finally, we ask Him to defend us against Satan and to lead us away from evil. Most of us will elaborate on the “bread” part, giving God of a list of our needs, including the needs of others. We know our loved ones in purgatory may need us to pray for them. That’s a good thing. I have a list of people that I add every day, including all of you. But we know that God knows us better than we know ourselves. He knows our needs and He knows our temptations. If we were to suddenly lose our memories and could only recall this one prayer, it would really be all we need. Note: After I delivered this homily I sat down and realized I had missed a very important point. He taught us to pray in the plural tense, our Father, give us this day our daily bread. That’s crucial. Who is the us we pray for? Is it our families? Is it the people in our parish? Is it all white Republicans? Is it just Democrats? Who we include in our prayers says a lot about us, doesn’t it?